On October 1, the first day of the government shutdown, I joined 50 federal workers in an impromptu all-day protest at the U.S. Capitol. Just hours before, we were indefinitely suspended from our jobs. We reported to work, signed papers acknowledging the furlough and left. We had been preparing for a shutdown for several days, so wasn’t a surprise. It’s the second time I’ve been furloughed this year. The first time was due to the sequester. The few of us who went to the Capitol didn’t know what to expect. I went there thinking I would be the only one to show up. Several others showed up with the same mindset: disgusted and worried about how being effectively unemployed would affect us. 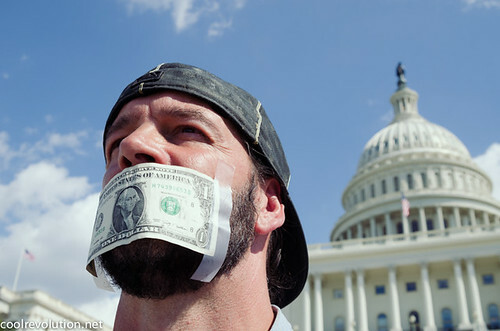 Most carried signs to express their frustration, but I taped a dollar bill over my mouth as a metaphor for what I believe is the root cause of problems in our government. I believe that money has silenced the voices of reason, voices which should serve as the basis for a functional government. My fellow demonstrators and I worried that our protest could be cause for our employers to take action against us, but our concern outweighed the risks. We felt it was time to act. There were precious few of us, but as the day wore on more joined our ranks. 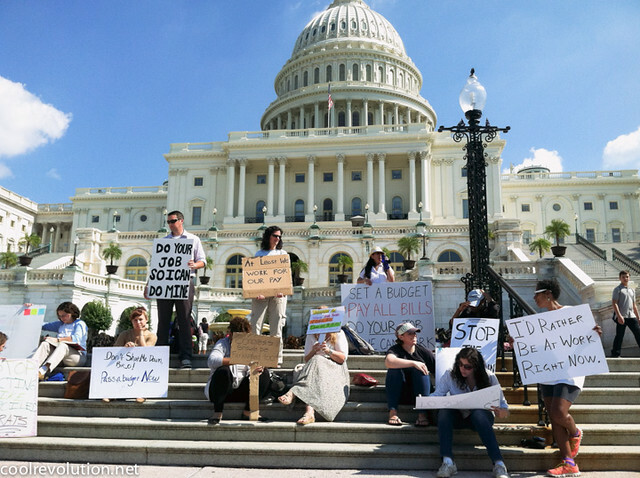 Inside the Capitol, Congress clashed in a power struggle which will determine our fates and those of the other 850,000 civil servants who will lose pay and benefits for an indefinite period. We stood all day holding hand-made signs, silent testimonials in magic marker: “End the Shutdown,” “Defund Congress Not The Federal Workers,” “Don’t Shut Me Down Bro,” and “Set A Budget, Do Your Job, So We Can Work.” One man held Dr. Seuss’ Green Eggs and Ham, making fun of Rep. Ted Cruz who read the book on the House floor last week, while I wore a dollar bill over my mouth, remaining mostly silent. Soon the press noticed our signs and began taking pictures and asking for interviews. No one would tell journalists where they worked, a common question, just that we were federal workers or contractors from various unnamed departments or agencies. Some people refused to speak to reporters altogether, out of fear of repercussions, but what those repercussions could be was anyone’s guess. But I wasn’t afraid to speak, and I tried to reasonably explain to them why I was there. We stayed there until dark–nine hours, exchanging the details of our work among ourselves and the hardships we faced with yet more furlough days on top of the days already lost earlier this year. One man confided that he worked at NASA, another worked at the Navy Yard. One woman worked at the DOT going on fifteen years. Another is an attorney for an agency she would not identify. Yet another is a receptionist for a contractor. One man works for a military reserve unit as a firefighter. Although he was not furloughed, he is upset about the way government is going about its job. All of us have bills and rent or mortgages to pay, families that depend on us to provide, spouses or children. One has a sick mother at home. The unexpected furlough is the bullet hitting the bone, a time of difficulty, made worse by the uncertainty of when it will end. Nearly a thousand tourists passed by this first day, taking pictures and asking questions about the protest. We unwittingly became the exhibit tourists could visit, unlike the pandas and the bell tower. All the District’s monuments and museums are closed today, barricaded because of the shutdown. One tourist picked up a sign and joked about not having a job. It angered some of us but he didn’t know better. Two things were certain: First, there was collective disappointment that more federal workers didn’t show up to protest with us, what is obviously not their fault. And second, our anger ensured we will return to continue protesting tomorrow. With the government locked in what seems to be an ideological disagreement, the shutdown may go on for weeks. Several of us committed to return the next day and the next. Each day it goes on, we know that we as well as the American people at large are losing out.